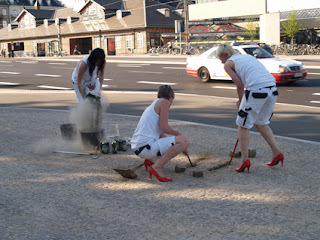 High Heel Sisters are happy to announce that we are now part of the archive re.act.feminism #2 - a performing archive. re.act.feminism #2 - a performing archive is a continually expanding, temporary and living performance archive travelling through six European countries from 2011 to 2013. It presents feminist, gendercritical and queer performance art by over 120 artists and artist collectives from the 1960s to the beginning of the 1980s, as well as contemporary positions. The research focus is on Eastern and Western Europe, the Mediterranean and Middle East, the US and several countries in Latin America. On its route through Europe this temporary archive will continue to expand through local research and cooperation with art academies and universities. It will also be ‘animated’ through exhibitions, screenings, performances and discussions along the way, which will continuously contribute to the archive.